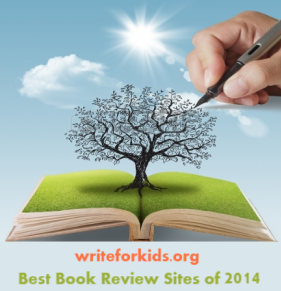 Jen Bryant and Melissa Stewart are the dream team of children's nonfiction picture books. A River of Words won a Caldecott Honor in 2009, and A Splash of Red: The Life and Art of Horace Pippin won a Sibert Honor and a Schneider Family Book Award in 2014. The pair has collaborated on another picture book biography, and it's a real gem! The Right Word: Roget and His Thesaurus follows the life of Peter Roget, a shy man who enjoyed making lists, collecting words, and observing the world around him. Roget spent years collecting and organizing words by topic and published his thesaurus in 1852. Bryant writes in an engaging narrative style that captures the essence of Roget's story. At times the text is arranged vertical panels to reflect Roget's lists. Sweet's signature water color and mixed media collages are perfect for conveying Roget's story. Sweet masterfully places words throughout the illustrations to show how Roget was an observer of the world and a collector of words. Covers of old books and pages from texts are used creatively in the collages. Young readers will enjoy poring over the book's endpapers that contain Roget's thousand word "Plan of Classification." Even though many young readers (K-2) won't be familiar with a thesaurus, they will enjoy reading about the man who created it and learning about how its helps writers improve their word choice. 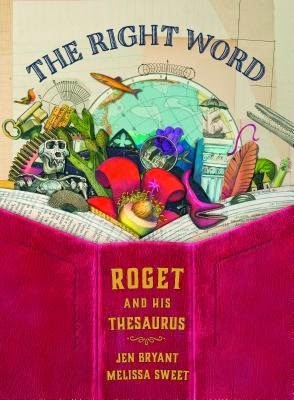 The Right Word: Roget and His Thesaurus is one of the best nonfiction books I have read this year and is a must-buy for any school or public library. Melissa Sweet shares her process for creating the illustrations on Seven Impossible Things Before Breakfast. Download a classroom discussion guide. View a book trailer for The Right Word.